Sweetly B Squared: The Liebster Award! I am so honored to announce I've been nominated for a Liebster Award by Run with Jackabee. Since my blog has been running for a while, I remember being part of blogging groups - yes, before Facebook - where we had awards like this that we shared with each other, which shared great new blogs with our readers! So fun!! 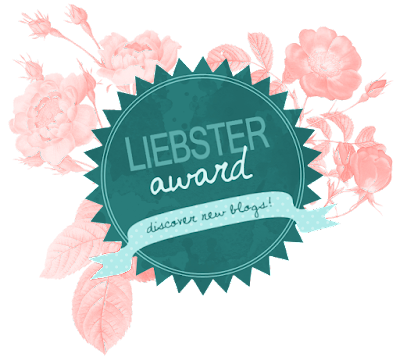 So what is The Liebster Award? It is an award given to bloggers by fellow bloggers. The whole idea is to promote and acknowledge bloggers for their hard work, accomplishments and build a community for bloggers. Once a blogger is nominated, they are to post 11 Random Facts about themselves, answer the questions given to them by their nominator and ask eleven questions of the bloggers they have nominated for the award. It is a great opportunity to meet other bloggers and get to know a little bit about them. I really like wearing my hair short. Part of the reason is that otherwise I chew my hair. I always have my toenails polished if I wear flip flops. My daughter thought this was an actual law and tried to tell a friend at the library that she couldn't wear sandals without toenail polish. I had to explain that it's more of a family rule. I really, really like my fish aquarium. The kids say it's theirs, but it's not. I drink Cherry Coke like other people drink coffee. The older I get, the less need I have to see other people, like, in person. I used to wear 4 - 5" heels, but ended up with back issues. I now can't wear high heels. I love the house we live in, and never plan to move again. Ever. My biggest regret when my kids stopped napping is that I have a much harder time getting away with a nap now. I really like naps. 1. If you could have any animal (wild or domestic) as a pet, what would you have? Hmm... I'm not really big on taking care of things all the time, so the kids are enough pressure. I think I'm good with my old cat, my fish, and my frogs..
3. Most insane hospital experience (that you are comfortable sharing)? I'm always amused that when I was in labor for my son, I had been admitted to the regular labor & delivery area, but wanted to birth with a midwife from the natural birthing center. So when my water broke, I called down the hall on my cell phone. The midwife came to my room and stayed til my son was born. 6. Does your name have a story? Well, I did have an uncle who would only call me by my middle name, because he had an ex-girlfriend with the same first name. I imagine that would have seemed super weird to a kid. I don't think we saw him often. 7. Are you left-handed or right-handed? Right-handed. 8. What is the craziest color you have dyed your hair (if you have dyed your hair) I used to like dark colors like burgundy. Now I look like a crazy old lady trying to hard if I do it :( I've done my hair both black and crayon red for different Halloween costumes. It's only hair, so I used permanent dye, and it came out over time. 10. What is your dream career? I'm not really fond of working. LOL I'll plan to stick with being a mom, writing, and direct sales. If you were to have a baby/adopt a puppy/take in a stray turtle/whatever right now, what would you name it? Do you prefer planning on paper, or electronically? Describe your best customer service experience. Where do you feel most comfy? Do you have a lucky number? Is there a reason behind it? Tell me! Tell me the funniest thing that has happened to you recently. Be sure to come back and leave me a link - I want to check out all your fun answers and facts! Thanks for the nomination, Becky! I'll try to get a post up within the week :). This is such a fun post. Really makes me miss the old school blogging community that once was though. Thanks for the nomination - love your answers. Wrapping up Asheville today and moving tomorrow - so it will take a day or two but will answer the questions and nominate another. Congratulations on your Liebster nomination! It was great learning a bit more about you, too.